TOP SERVICE AWARD BY YAHOO! Thank you customers for taking the time to fill out your Yahoo store evaluation for Marie's Candies. We appreciate your patronage. 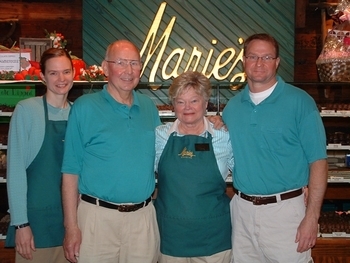 Some of our customers have been ordering from Marie's Candies for over 40 years. We'd like to share a few of our customer stories with you. Special thanks go out to each of our customers who have taken extra time to write us special notes about their own personal history with Marie's Candies. "It's the best chocolate I have ever tasted. I'll drive 6 hours for some. I'll send gifts of chocolate to friends on their special day! Love the customer service." -- Jessica F.
"Marie's Candies is of the highest quality in all things...from the amazing taste to the customer service....it is the BEST!" --Laura E.
"I must say there isn't a time I've been in there that I haven't been greeted with a friendly smile and "how can I help you". It is nice to see that customer service still means something to a business. Keep up the GREAT work Marie's." --Valerie B. "Almost every significant event in my life has been celebrated with Marie's---from holidays, birthdays, my wedding---even the hardest day was accompanied by the biggest box of Marie's I'd ever seen to help my family get through it. It has become more than a tradition in my family---it's part of who we are. Thank you!" --Jenny K.
"I love the special orders for Easter (asking for a blue dragon on an Easter egg!). I loved being on the call list for nougats; the attention to detail on every wrapped package in the store." --Amanda A. "I love to bring my grandchildren to the day after Thanksgiving gingerbread house event!! We all have so much fun, thank you!!" --Rita M.
"I love the originality of the candy. Also, that trademark bag! I love when I come home to one sitting on the counter. It's like the iconic Tiffany's bag...but better...because it's chocolate!" --Ashley E.
"I always love the little chocolate favors wrapped in foil - I can find one for every occasion that I need something to put on my tables. Thanks!" --Betsi B. "I love all the fun decorations for each season and holiday! It is always a treat to see what new things they have. The store is always beautifully decorated and the candy is the absolute best!!!" "Marie's is our hometown memory maker to begin with, and is part of every special holiday we have, and the staff is so very kind to all who come there, and I may call and order ahead and pick up my purchases at my earliest convenience. And the treats are all amazing!" --Ina W.
"I love the clearly personal touches around the shop. Every time I walk in, I just know how much effort and care was put into everything I see... and I know how yummy it will be when I buy it all and take it home." --Shelby E.
"I love that all the candy and recipes are still the same as when I was younger. Each Easter my grandparents would get us a peanut butter egg and they always came in those adorable boxes with the chicks and bunnies on them. I love that I can walk in there at Easter time and still get those same boxes with the cream filled eggs. Keep up the fun traditions, Maries Candies!!" --Camy A. "When my daughter planned her wedding she wanted chocolate wedding cakes for favors and we wanted Marie's chocolate. However you did not make chocolate wedding cakes, therefore had no mold. I found the molds and you were so kind to make the chocolate wedding cakes, delivered on ice as well. They were wonderful, delicious and beautiful on the tables at the reception. Thank you so much for being so helpful!" --Ann M.
"My favorite thing about Marie's Candy is how you can go in looking for a gift and they have a vast array to select from. If you cannot find something, they will put what you would like to include into a gift package. You will never leave Marie's feeling as though you were not noticed, as well as carrying out something you needed or just wanted. They are friendly and very helpful." --BJ M.
If you have purchased Marie's Candies over the years, we'd like to hear from you. Please write info@mariescandies.com.